Welcome to the world Quinton! He entered the world four weeks ago at a healthy 8 lbs 6 oz. This picture is our second day at home with our new guy. The past four weeks have been actually very nice – I admit I was worried about quite a few things, as most moms to be tend to do. 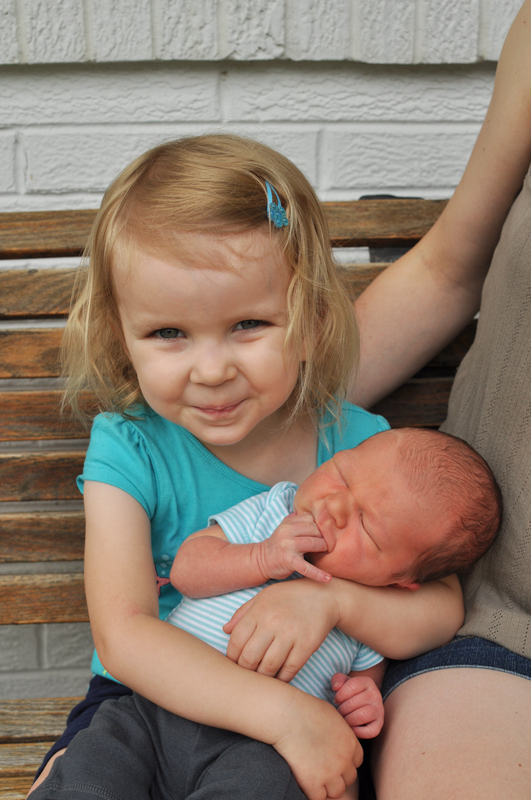 However, things are going well for all of us and big sister Greta is adjusting well. 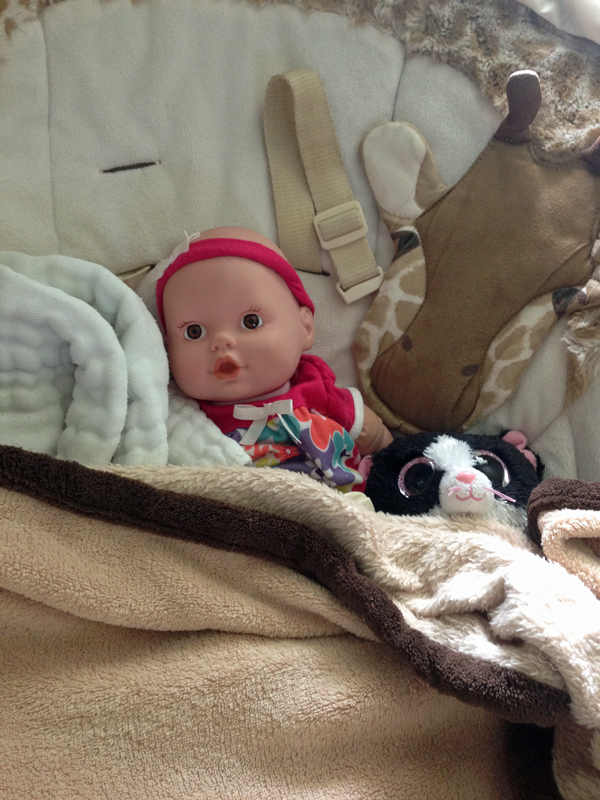 My advice for parents of single children, about to become multiple children: talk about babies, read about babies, watch babies, look for babies, and seek out babies as much as you can before the new sibling comes along. We hit the library for picture books on babies, watched video clips on babycenter.com, role played with her baby dolls, read magazines about babies, asked family and friends with babies to allow questions and assistance from Greta whenever appropriate. Let me tell you, it paid off. 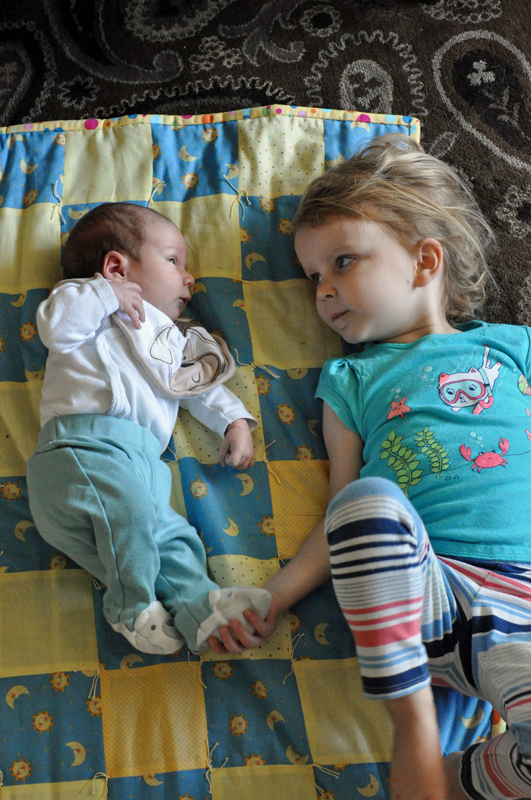 Aside from a few jealousy issues at the beginning, she has been a happy helper and eager to take on the big sister role. Our biggest meltdowns involved the question, “Why do I have to go to bed if Quinton is still awake?” I and finding her baby dolls in Quinton’s swing, on his changing table, in his crib, and wrapped in his blankets. She watches me carefully and mimics everything! Luckily her cousins got her a diaper bag complete with diaper wipes, bottles, cell phone, and changing pad so she can mimic with her own things and take them with us when we are out and about. 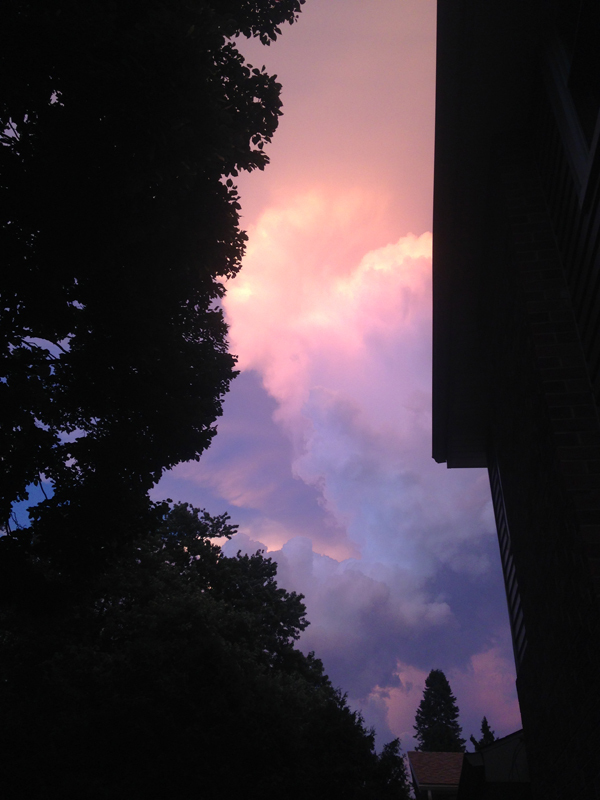 Speaking of getting out, right around Quinton’s birth we had a spell of rainy weather – to the point of wondering whether Iowa was entering monsoon season as North Carolina did every fall with the onslaught of hurricane season. Just after he was born, the clouds lifted and the weather has been beautiful for venturing out with a new baby. So get out we have done! Baby round two has been different of course, I learned from baby one too late that newborns are portable and there is no reason to sit on one’s bum when they sleep constantly! Not that my three-year old would allow such a thing to happen anyway. 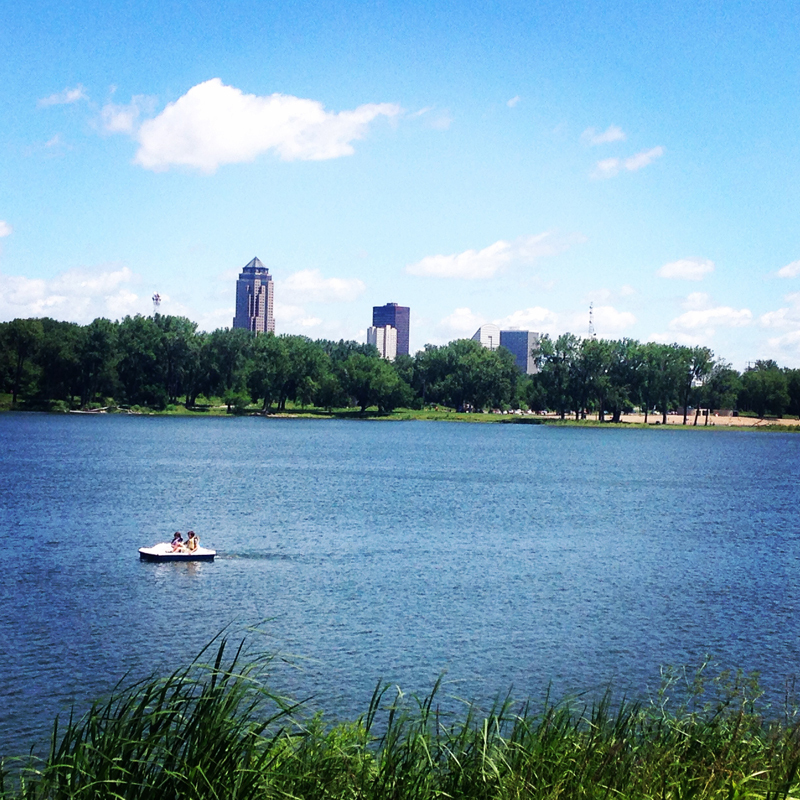 We have been enjoying sunny walks around Gray’s Lake as a family. I am determined to start the physical activity earlier this time around, in hopes of maintaining a better sense of well-being and to avoid feeling the stresses of starting a new school year and unpacking my classroom from a summer of remodeling with a new baby. Plus, I am eager to get back to riding my bicycle. It’s been far too long and watching RAGBRAI and Tour de France coverage has me chomping at the bit this year. Speaking of bits, we enjoyed the county fair as some free and very engaging entertainment. I cannot ever remember it ever being this nice of weather when I was in 4H and showing at the fair! The Polk County Fair takes place at the State Fair grounds every year and showcases all the hard work and dedication of 4H and FFA youth over the past year in Polk County. 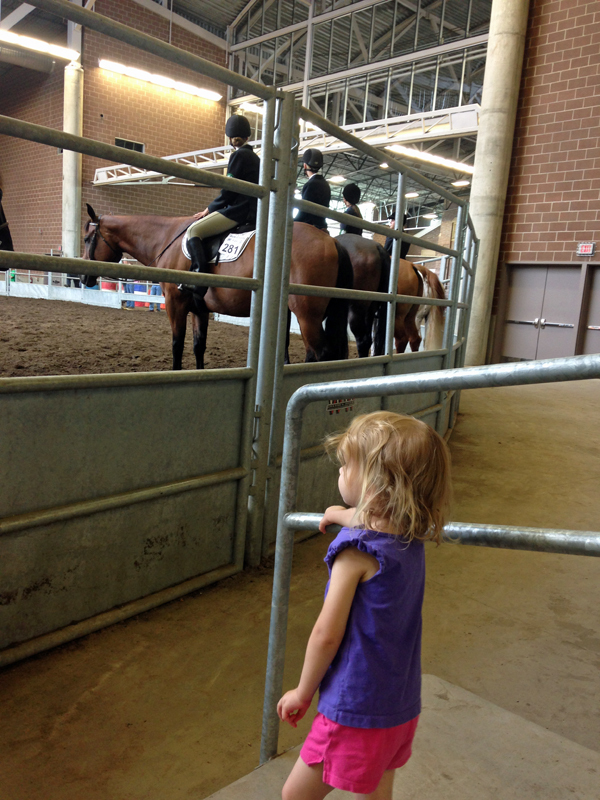 Greta enjoyed watching the horses compete and the jumping event was her favorite – especially when one horse while practicing, stopped and walked around instead of jumping. She laughed and laughed at that. This week the pleasantly cool weather continues. 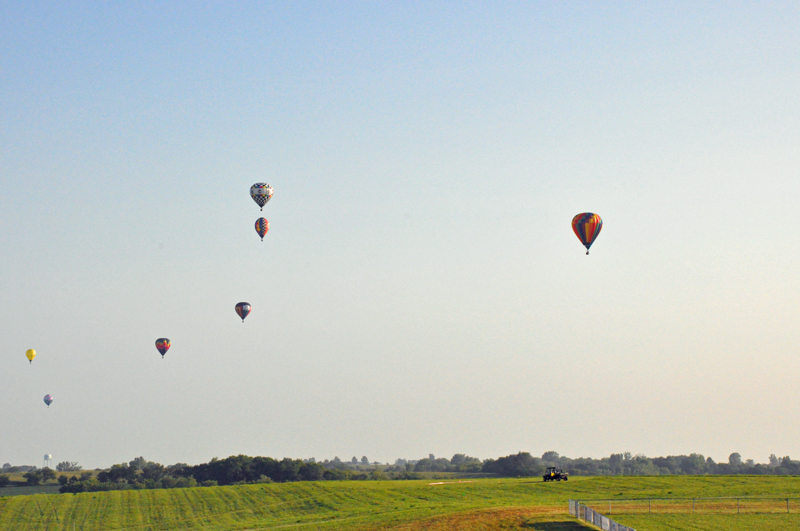 We enjoyed a morning at the National Balloon Classic in Indianola, IA watching hot air balloons. Flights are at 6:30 AM and 6:30 PM daily for the entire festival and the morning session is free entrance. I got out for sushi and even tried a new place! I kept hearing about how Wasabi Chi was the best sushi in town – I finally decided to check it out when my delivery nurse said this is the only place she goes anymore for sushi. I am pleased to report that Wasabi Chi on Douglas Avenue in Beaverdale did not disappoint. 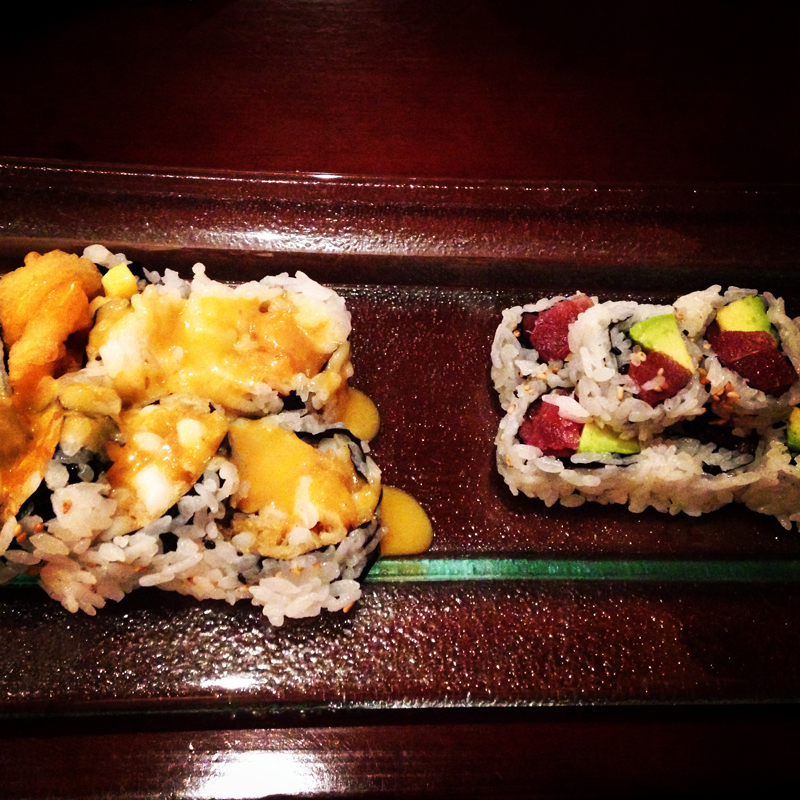 Their lunch specials are to die for and hard to choose between – the crispy calamari mango roll, on the left, was my favorite. I had two rolls, miso soup, and salad for $8.95! I have also been experimenting with my own simple and satisfying recipes at home. Read: no time for elaborate cooking right now. 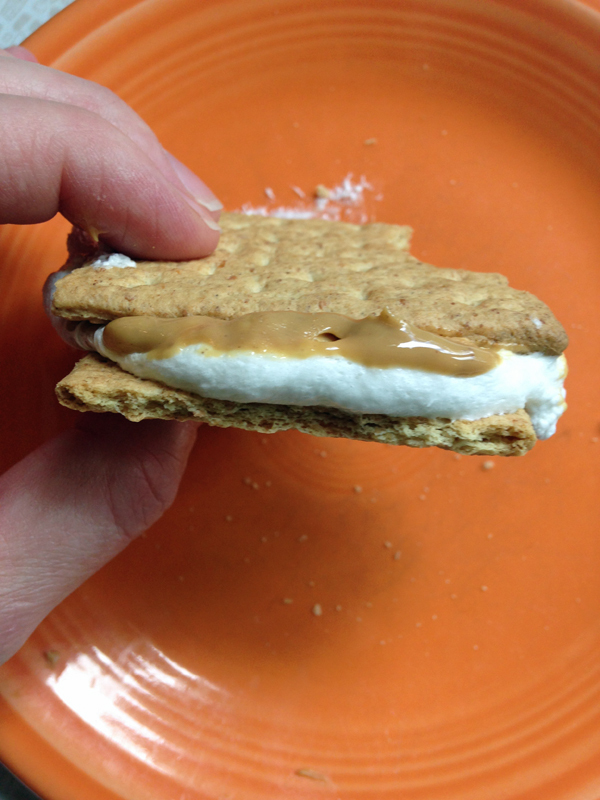 This heavenly dessert is simply two graham crackers, with a smear of peanut butter, topped with two marshmallows, and then microwaved for 10 seconds. Behold: the fluffer nutter s’more. You are welcome. Happy almost August everyone. Where did this summer go? 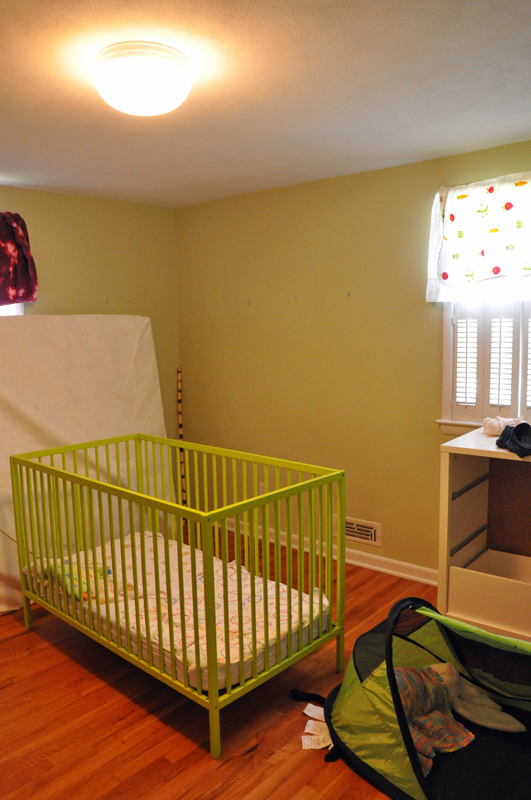 This is what the now baby room looked like when we fist moved in to our house a year ago. It became a dumping ground until we moved in completely, hence the odd assortment of items in the room. This room was so blah and dark when we moved in, due to the wooden shutters that covered up the windows and a paint color that needed refreshing. The room started off as Greta’s room and actually was about the same color as her old room in Greensboro. I never did love the color in either room – Greensboro’s was just so close to army green and this house, though more of a sage green, was not what I really wanted in a bedroom. I knew the color had to go eventually, but we lived with it for the better part of a year. The room is much brighter now – we went with white on 3/4 of the room and a bluish gray on the other 1/4 of the room. I have other paint ideas that I would like to do at some point, but getting it done was the name of the game with this nursery. We reused Greta’s old crib, got a new rocking chair, and used black out roller shades for the windows instead of the shutters. 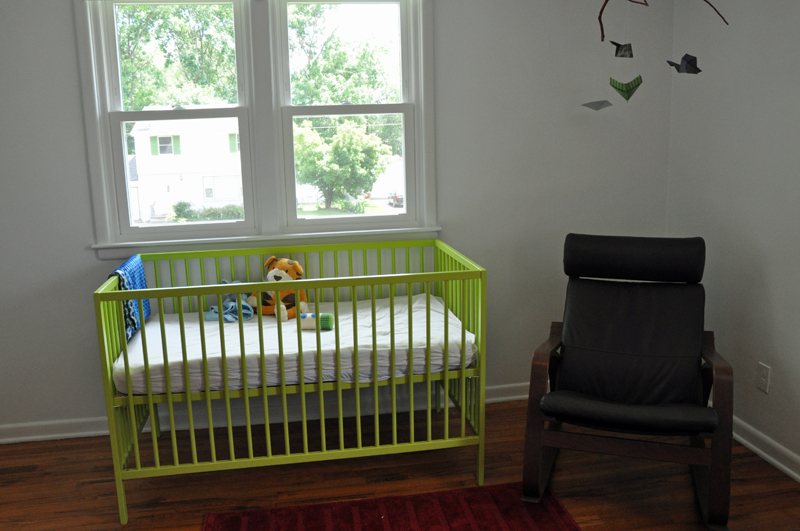 The crib doesn’t go with my other color palette quite as much – though one could argue the green is in the complementary color scheme with the reds. 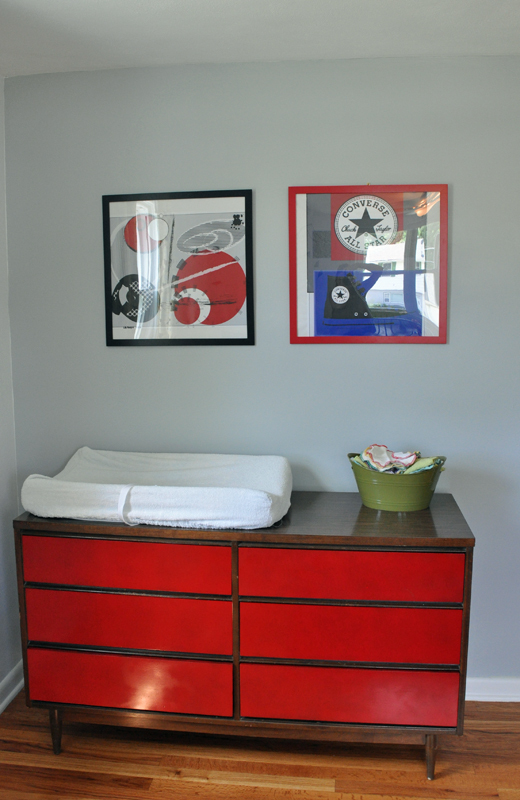 I was not about to paint an Ikea crib – just not something I was in the mood to do. The dresser has already been shown off in a previous post. I just love the way it turned out. It has more than enough room for all the baby essentials and keeps all the cloth diapers easily sorted and organized! The two large prints above the dresser are ones that I completed in an Illustrator class I took earlier this year. I knew what colors I was leaning toward at that point and created 2 images in the general gray/black/white/red palette. His toys and books (what hasn’t been pilfered by his sister) are organized on a hand-me-down bookcase we’ve had for years that will no doubt see many more years of work. He even got his first bike themed artwork at the Des Moines Pedal art show earlier this spring. We kept the room sparse, just like Greta’s room. I find it easier to navigate a sparse kids’ room in the middle of the night. 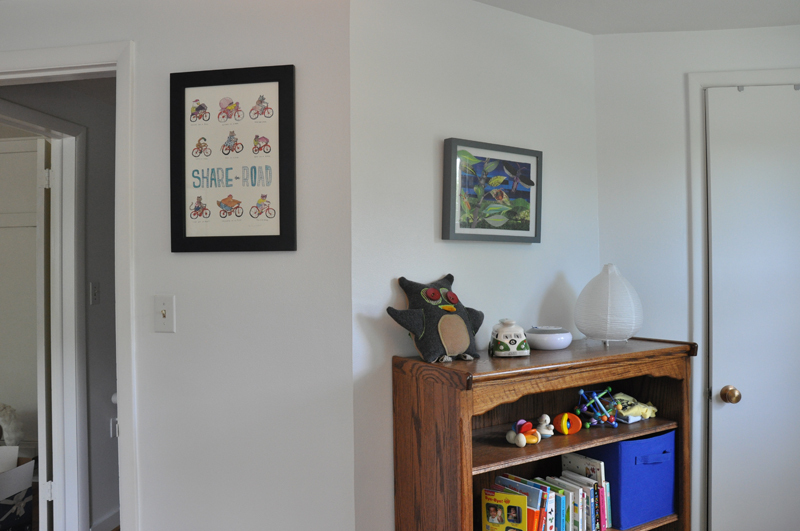 Two walls are still bare of artwork – I like to give my kids a chance to choose some of their own decor to make their room their personal space.